Upcoming Divorce Cooperation Institute seminar. Mediation can make a huge difference. Oral arguments on grandparent visitation case. “Earn-out” payments from sale of business, Engagement ring when would-be groom was still married, Hague Convention on Civil Aspects of International Child Abduction, UCCJEA, child removal, upward child support deviation based on extraordinary expenses of the child’s extracurricular activities and more. Articles on Pet custody, living together before marriage and cost of divorce. The Divorce Cooperation Institute will be presenting its annual seminar at the Delafield Hotel on November 9, 2018. This year’s topic is: “Practically Cooperative” and I will be co-speaking with Attorney Dave Karp. For more information and to register, visit the DCI web site. If any attorney has need for a mediator in this field, please call me at (414) 732-3397 or send me an e-mail. I would be pleased to try to help you settle a case. Details about our firm’s mediation services can be found on our office web site. Oral arguments for Michels v. Lyons, 2017AP001142, the grandparent visitation case, is scheduled for Nov. 7, 2018 at 9:45 a.m.
Usually, an engagement ring is a conditional gift, the condition being the marriage. If there is no marriage, i.e., the parties break up before the marriage, the donee must return the ring. This case has a delicious twist: the would-be groom proposed and gave his would-be bride the engagement ring while he was still married to his first wife. The court held that the condition of marriage was void, “because he conditioned his gift on something he legally could not do-marry[.] … [C]conditioning a gift on marriage when one cannot lawfully marry violates public policy and constitutes unclean hands” Hence, the would-be bride could keep the ring. In this Hague Convention on Civil Aspects of International Child Abduction case, the trial court determined that Italy was the habitual residence of the child, and ordered the return of the child to her father in Italy. On appeal, the Sixth Circuit held that the determination by the trial court was supported by a preponderance of the evidence. Of significance to the court: the parents had moved to Italy to pursue career opportunities and live “as a family” before child’s birth, the parents secured full-time jobs in Italy and purchased several items necessary for raising child in Italy; the mother pursued recognition of her academic credentials by Italian officials, applied for Italian driver’s license, set up routine checkups for child in Italy, registered their family to host au pair there, invited American family member to visit them there in six months, and lacked definite plans to leave Italy. The three dissents would have remanded the case back to the trial court for consideration of the evidence in light of Ahmed v. Ahmed, 867 F.3d 682 (6th Cir. 2017). After the mother moved to India with the child, the father commenced custody proceedings in the United States. The court held that even Indian did not have concurrent jurisdiction with the United States under the UCCJEA, India could be considered the more appropriate forum for litigating child custody issues. The court reasoned that the UCCJEA emphasized exclusive jurisdiction and avoided concurrent jurisdiction. Thus, following the California court’s finding that it had exclusive jurisdiction, California could determine it was an inconvenient forum, such that another state could exercise jurisdiction, and UCCJEA inconvenient forum principles applied regardless of whether the other state adopted UCCJEA. After the support magistrate imputed income to the father in the amount of $80,000 per year, the father appealed. The appellate division held that “the father’s testimony on the subject of his income was not credible, but instead was suspect, vague, and contradictory.” Thus, the court providently exercised her discretion in imputing an annual income of $80,000 to the father in calculating his child support obligation based on his prior employment history and high earnings in the mortgage loan industry. The mother appealed from an order that denied her petition to relocate to North Carolina and directed her not relocate with the child outside of Monroe County without court approval or the express written consent from the father. 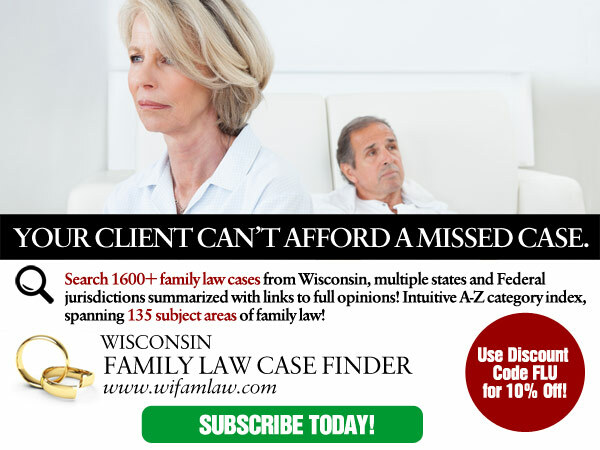 The appellate court affirmed the denial of the petition to relocate, but vacated a provision in the order that transferred primary physical custody of the child from the mother to the father in the event that the mother relocated outside of county. Such a provision impermissibly purported to alter the parties’ custodial arrangement automatically upon happening of specified future event without taking into account child’s best interests at that time. “In the final judgment, the trial court found that the parties had been married 20 years while Husband was in the military; that during their marriage, Wife had served as the family homemaker and stay-at-home mother, that she had periodically worked in child care, and that she had obtained no education beyond high school. The trial court also found that Husband had retired from the military with a medical discharge, was determined by the Veterans’ Administration to be 100% disabled, and was receiving “monthly retirement benefits in the amount of $4,162.” Concluding that such monies constituted marital property, the trial court awarded Wife a portion of that pay.” Yikes, that is clear error. No part of the disability pay is marital property. See Howell v. Howell, 581 U.S. —-, 137 S.Ct. 1400, 197 L.Ed.2d 781 (2017). The trial court did not err in granting an upward deviation from the child support guidelines’ presumptive award, considering the extraordinary expenses of the child’s extracurricular activities. Although extracurricular activities are included in basic guidelines support, ongoing extraordinary education expenses may constitute special circumstances that justify deviation from the guidelines, citing In the Matter of Arabian & Squillante, 151 N.H. 109, 112, 855 A.2d 560 (2004) (explaining that the trial court on remand may consider whether extracurricular activities created a special circumstance “that would justify deviating from the guidelines”).